Complete Government Contracts & Commercial Accounting Software. Our flagship accounting product. Stand-alone - or coupled with CCAS Capture time and expense - an unparalleled breadth of real-time financial and project cost data is always available to authorized users. Our single-user version of Light4 that includes bank and credit card transaction importing, and much more. There’s also LightSTORMd, the very same app but built for the latest iOS devices, exclusively. Created for Professionals, Consultants and their iOS devices. Uncompromising timekeeping, expense reporting and invoicing Apps. Companion PC and Mac applications are included. Permanent and annual software licensing options are offered. Our completeness and fair pricing sets us apart from our competitors. Delivered pre-configured, our software is easily and quickly deployed. (optimized results and "wins" are the goals). ▪	Your DCAA Preaward Survey is successful and your contract win is awarded without delay. ▪	You are always ready to track, report and accurately invoice project costs and expenses. ▪	Your balance sheet accounts are quickly and easily reconciled, their accuracy confirmed. ▪	The DCAA critical - and typically resource-consuming - reconciliation of your "Salaries Payable” account is automatic. 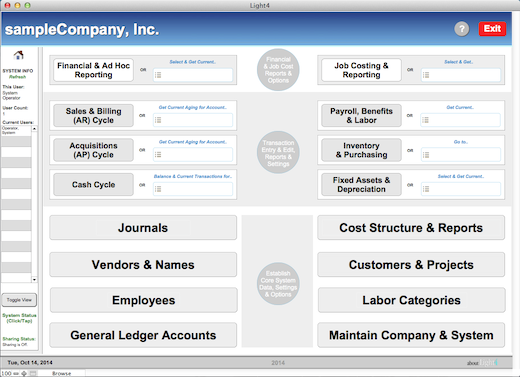 ▪	A wealth of financial, job cost and management reports are available for all periods, always. ▪	You're always DCAA audit ready with Incurred Cost Submission reports generated with a button-click. ▪	You stay ready to aggressively - and smartly - bid on new or follow-on work. ▪ You’re able to confidently focus on the work at hand. All CCAS Light software provides for unlimited employees. A CCAS Light system "user" is defined as any individual that you've authorized to access it. For example, a 5-user Light4 license allows for simultaneous access by any 5 of your employees and access privileges can be reassigned at any time. Run Unlimited Instances of Your Light License. ▪	Run separate instances of Light for budgeting and forecasting purposes. ▪	Run a copy, or copies, of your books separately - in “Pro Forma” mode - to test “what if” scenarios. ▪	Provide a full copy of your books to your accountant(s) for monthly, quarterly, or annual review. ▪	Move a copy of your Light books to your iPad or iPhone for true on-the-fly review. All of your instances of Light4 (and LightSTORM) can be run concurrently on a single computer (or device) or over your network or cloud and all is protected by Light’s comprehensive built-in, user-configurable, security controls. CCAS Light & Capture: Compliance-Savvy Stalwarts. The most important standards our software attempts to uphold are yours. This idea is fundamental to our work. Because our software focuses on the needs of contractors whose accounting may be subject to rules presented in the Federal Acquisition Regulation (FAR) - and enforced by the Defense Contract Audit Agency (DCAA) and other government agencies - we also make every effort to assure that your compliance with these regulations is complete and as easy and fluid as possible. So easy and fluid - and nearly transparently so - that if you didn't know what to look for, you might not even notice that it's happening. CCAS Light and Capture software are DCAA compliant solutions, fully satisfying DCAA's criteria for "acceptable" accounting systems as set forth in its Standard Form 1408. It’s all here. All Light functionality is accessible to authorized users from its "Home" screen (with no scrolling through "cryptic" sub-menus required). Run our software on a Mac or PC and - served over your network or the "Cloud" - any combination of them. Access as a "client" with iOS and Surface devices or run directly (and fully) on iOS and Surface Pro devices. With users located around the globe, our support must follow. The latest technologies help assure this. Software refinements, enhancements and any necessary fixes are delivered regularly. What it All Means for Contractors. Our pricing and new licensing options make our time-tested and field-proven software affordable for all. Affordable enough that cost can no longer be cited as an obstacle to the full accounting compliance and instant and comprehensive financial and job cost reporting capabilities of government contractors. That we minimize those efforts and costs usually required to get other software operational - and to maintain it - only strengthens our position. Given this, and based upon thinking consistent with that illustrated by DCAA's guidance on allowable "airfare" costs, our software's pricing fairly challenges our competition's price ”reasonableness": per the FAR, "a cost..that does not exceed that which would be incurred by a prudent person in the conduct of competitive business.” Yet, apart from our enabling companies to allocate more of their indirect cost dollars to other worthy applications - or to simply reduce costs - other considerations remain. With no add-on requirements whatsoever, we offer a GAAP and DCAA compliant solution that's complete, approachable and easily managed from the start. With all versions of Light allowing unlimited employees, our license agreement won't insist that we "share" in your success, but will instead assure our software's performance to help you achieve it. And our support - whenever needed - is second to none. 2. Perform On-Schedule and On-Budget. 3. Account for All as Required. 4. Repeat 1, 2, and 3. Winning contracts is primary. Sound pricing and satisfying items 2 and 3 (where CCAS software plays its strong supporting role) is what helps keep all alive and prosperous. "We are delighted with our CCAS decision." "…your support has been outstanding." "Great support..Installed it..and it went so quickly I almost couldn't believe it..it just sits there and works." "..thanks for responding so fast." "Your system is working great." "...everything is working great. Very satisfied, thank you!" Professions and diciplines have their unique terminology and acronyms. GAAP (Generally Accepted Accounting Principles) is one example. What do they mean for contractors? ERP (Enterprise Resource Planning) relates to software and its reporting of accounting, project and related data to assist in the informed management of business operations. CCAS software has embodied the totality of this concept from its very beginning. And what about EVM (Earned Value Management)? The idea here is to help answer the ongoing question: “How much have we done and can we get the remaining work done by it’s due date - and within our budget?” An important question to which all versions of Light responds. Protecting controlled unclassified information and the NIST SP 800-171 security standards? All CCAS software provides stong - system-wide and user-configurable - security controls. "Can we actually get all this done…without a major committment of resources? " Certainly. Delivered pre-configured, CCAS products transcend the "user-friendly" concept. By design, they're user-empowering, reassuring the efforts of mid-level staff, and solidly supporting seasoned professionals.